Total market cap is down around $6 billion, with all but one of the top 10 cryptos dropping in price by at least 1 percent. Bitcoin has done better than the rest of the pack in the last 24 hours, whereas Ethereum and Litecoin are both down almost 5 percent. Bitcoin slid below $6400 in the last 24 hours. The biggest drop occurred when around $150 was lost in just 15 minutes, after remaining relatively stable between $6.5k and $6.6k before that. 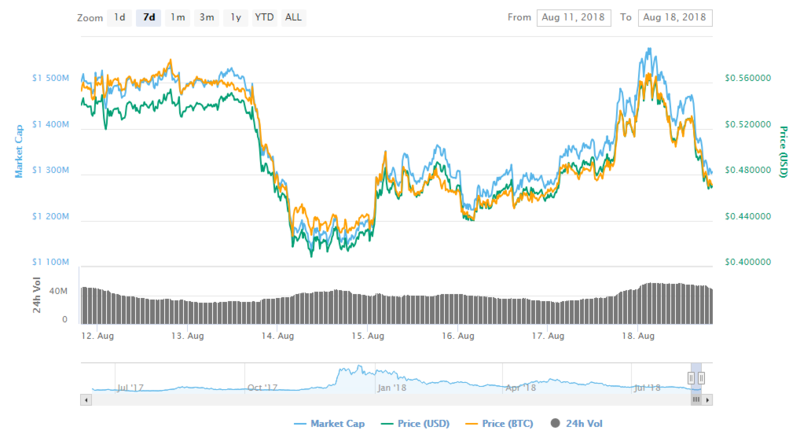 Most of the top 10 coins are down, with Ethereum (-3.97%), Litecoin (-5.33%), and Cardano (-5.52%) all performing particularly badly in the last 24 hours. In a pretty awful 24 hours for the crypto market, altcoins have performed even worse than the top 10 cryptos, with the Metaverse ETP token being the only coin in the top 50 to be up more than 1 percent. 13th-placed IOTA is down almost 10 percent, after a very volatile week.